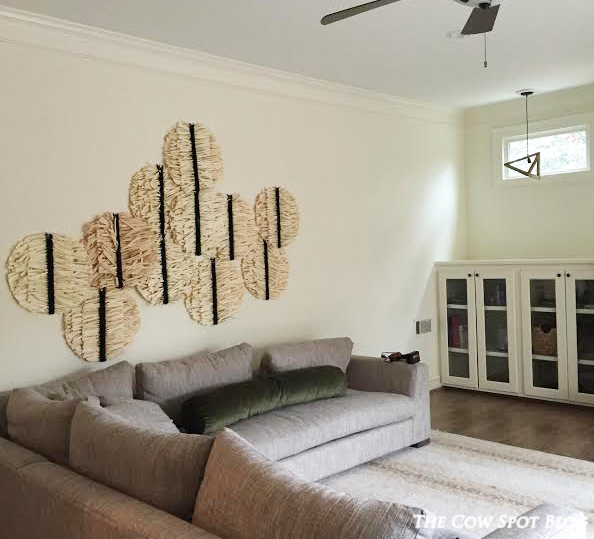 Now that you all have seen how we successfully treated the big ol' wall behind our couch I thought it might be fun to let you in on a little secret....Our big, beautiful map panels were not our first attempt at this wall. Nay, a few months ago, we put more than a few holes in that wall in an attempt at a totally different solution that turned out to be...............well, let's see how can I put this......A. DISASTER. So, way back at the beginning of the year I spotted this wall decor at Target. 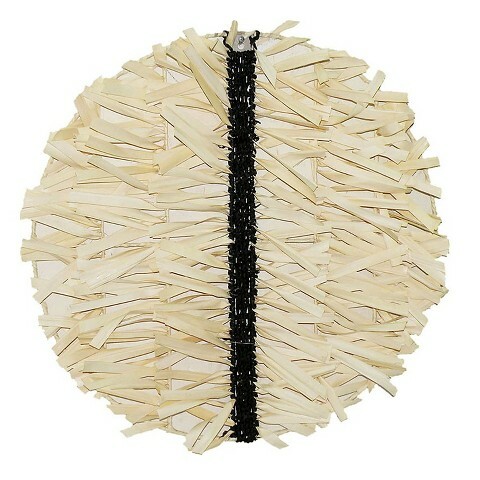 The "Palm Leaf Fringe Wall Art" or Ju Ju's as I call them were from the Nate Berkus Collection. I loved the texture, shape and pop of black. In my mind I could see a bunch of these ju jus layered atop each other over the couch. So, I did what any smart Target shopper does and I waited for them to go on sale and then loaded a bunch of them in my on-line cart and waited for them to arrive on my doorsteps. Once they came in we got to installing and the plan was.....are you ready for it? There was no plan. Literally, my smart self just thought, layer, one on another and go wide and tall and BAM little heart eyes would pop from my eyes. You can't get it right every time right? Oy. It wasn't the worst thing I'd ever seen but it wasn't good. The whole concept read as sloppy and just kind of weird. The pieces also seemed to bring a bit of a tribal vibe to the space when mixed with the rug. I don't know, it just did't feel right. So, I took them down one by one, Brent rolled his eyes and we just kind of hit the pause button for a few months. 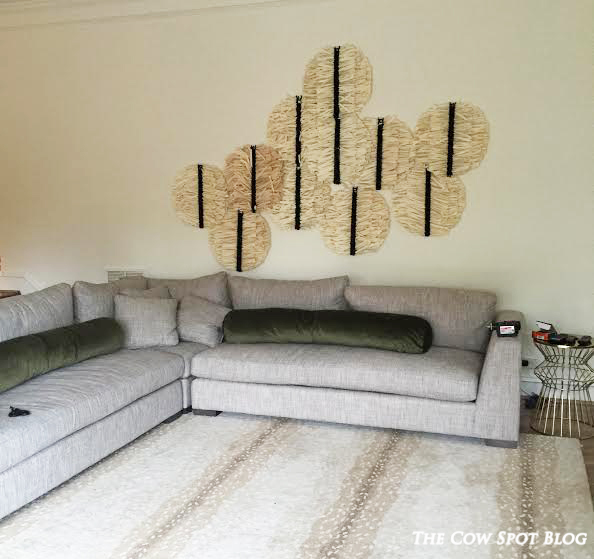 Then, one day I decided to focus less on what to put over the couch and more on what to do with all of my ju ju pieces I had stacked in the corner of my master bedroom. I had a lot of these guys and with a diameter of 20" I needed a big wall to fill them with. 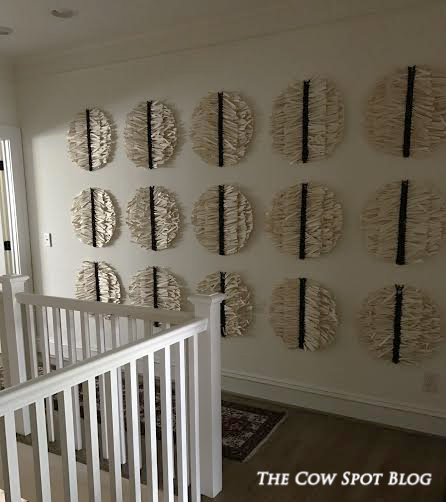 Insert the large landing wall at the top of the stairs. This wall leads you to our master bedroom and is 14' wide. Instead of trying to recreate the original layered vision we decided to go with a traditional grid install. I worked the math (scary!!) and Brent worked the drill and in about 30 minutes we knew the Ju Ju's had found their home. Oh mistakes....they sure are brutal, but when you get on the other side, sometimes you just have to laugh and learn, but mostly laugh. Submit NOW with I NEED HITS!! !